The gentleman is one of the fashion and lifestyle trend focuses for 2017 and beyond. 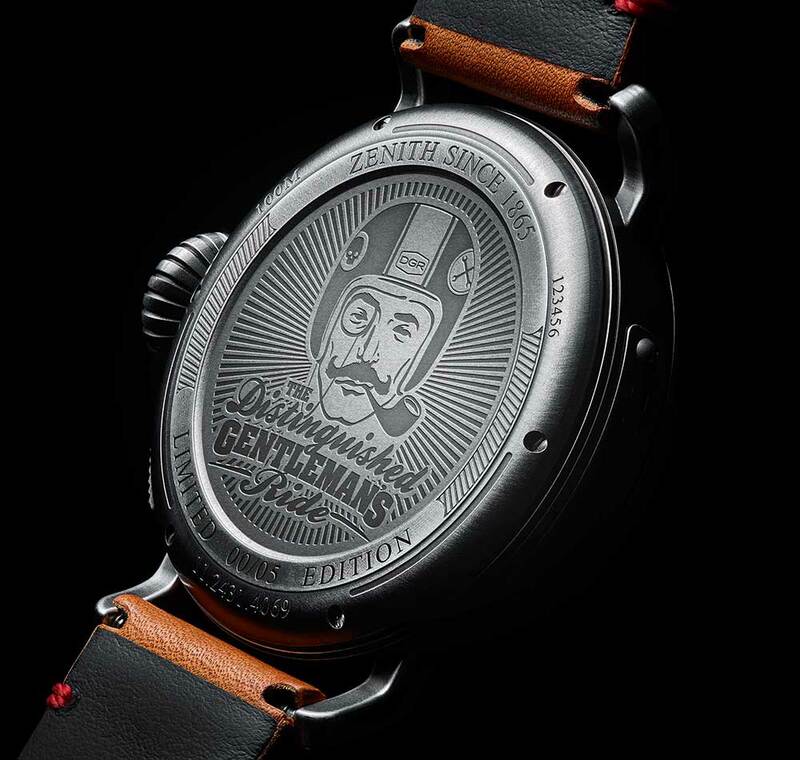 There are probably thousands of possible descriptions of a gentleman, but in visual terms, one definition could be “sobriety and eccentricity elegantly combined.” Here we take a look at some of the watches specifically offered by brands in relation to the modern gentlemen, along with the testimonials, models and images that they have used to present the products. This selection is in increasing price order. Published 22 October 2017, updated 19 May 2018. 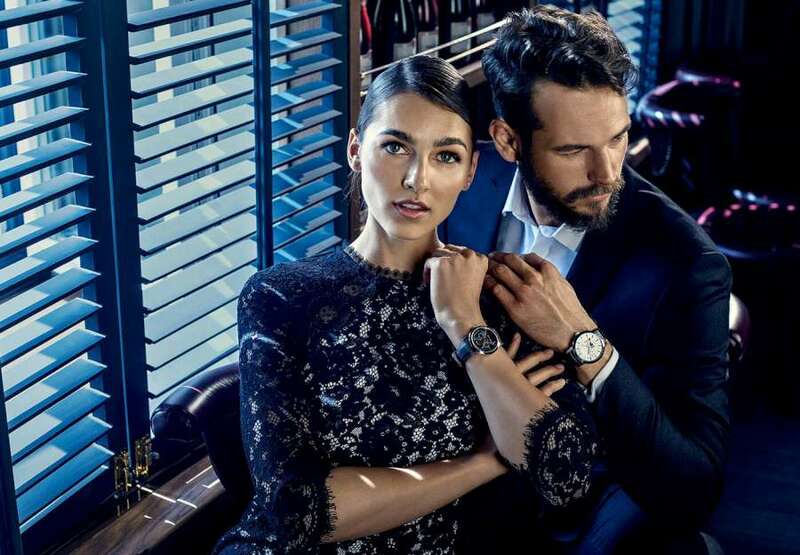 Tissot uses the word “gentleman” directly in the name of one of its latest men’s watches, available at a very low price. It combines some elements of classic watches, such as the printed guilloché-type texture on the dial, the fluting at the edge of the bezel, and stylized numerals, to create a period effect. The case is 44 mm in diameter, 12.4 mm thick, with a 10-atm water resistance. The sapphire caseback displays the new Swissmatic self-winding movement that has a power reserve of up to 72 hours. The Swissmatic is based on the Sistem51, the Swatch Group self-winding watch built on an automatic production line with a sealed movement on which no maintenance is possible. The Swissmatic movement on the other hand is partially accessible to a watch repairer, and it is made with some parts in steel and others in plastic. The view through the display caseback reveals the simplicity of the movement. 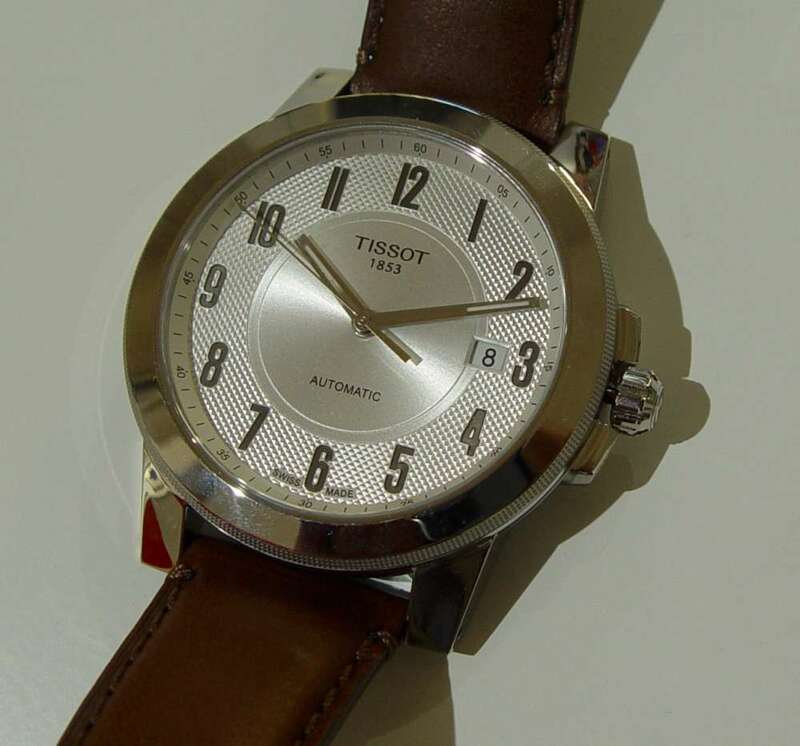 A very aggressively-priced product with which Tissot and Swatch Group want to ensure that they offer the lowest-price Swiss-made watch on the market. €355. 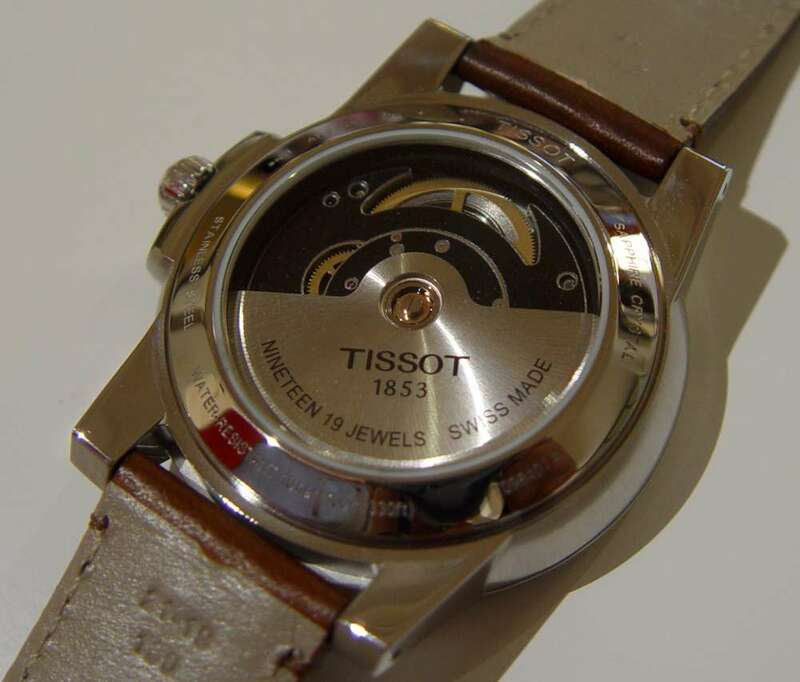 More info on the Tissot website. 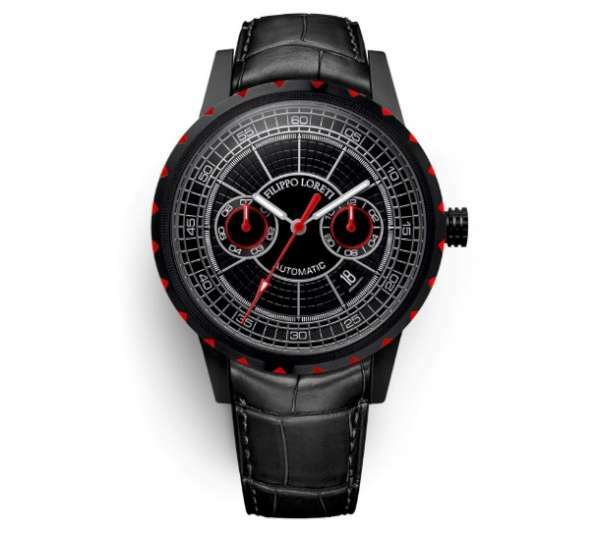 The Milano Black Red Automatic by Filippo Loreti is a watch with a self-winding Miyota movement, and an Italian-inspired design that gives it unique looks. At the price of €489, it is a readily accessible timepiece for any gentleman, with a lot of details that make it a pleasure to wear. It combines a touch of automotive inspiration along with intricate visual features that create a parallel with the classical architecture of the building that inspired it: Galleria Vittorio Emanuele, Milan. The architectural feel of the dial is combined with a logical arrangement of the printed guilloché and the fine pattern created by the slender metal lines. The printed guilloché reinforces the minute divisions, and the principal radial lines become hour markers. The two subdials, for day on the left and month on the right, are nicely framed, and continue the overall colour scheme of black with touches of red and steel. As is appropriate for a watch of Italian inspiration, the strap is made in Italy, in Italian leather. It has a printed alligator pattern. Even when new it is soft and supple, a pleasure to touch and smooth on the wrist. The folding butterfly clasp is easy to open using two pushers, and its position on the strap can be quickly changed to adjust it for your wrist size. Read more here. 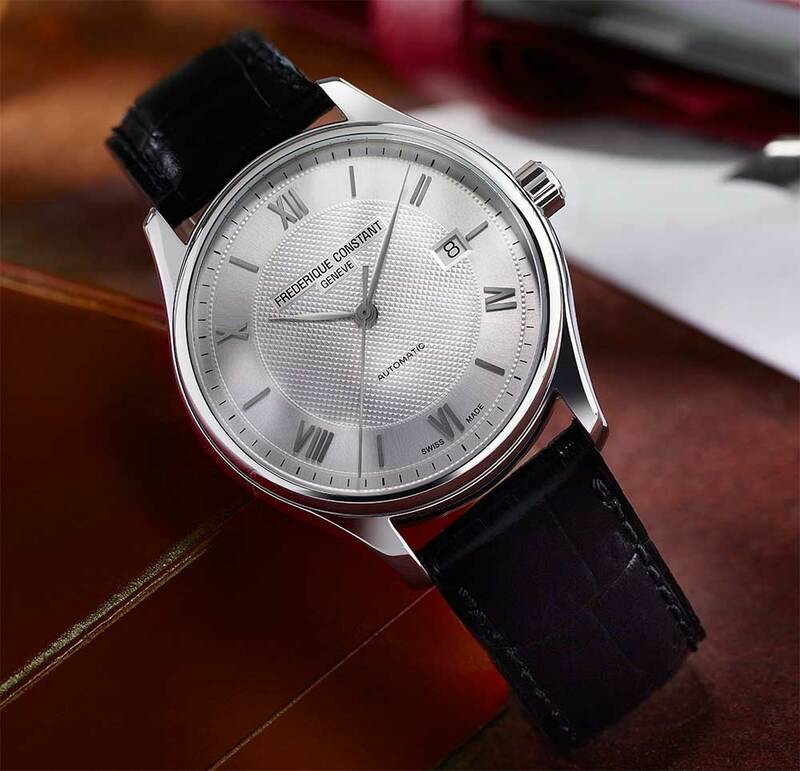 Frederique Constant make the daring claim that the Classics Index Automatic helps turn a man into a true gentleman. The entry-level price, starting at €850, makes it accessible to a wide section of the market. This version is in steel, 40 mm in diameter, 10.3 mm thick, water resistance 5 atm, with solid caseback. The dial has Roman numerals and guilloché which give it a feel of classical distinction. The FC-303 self-winding calibre is based on the SW200-1, providing 38 hours power reserve. Reference FC-303MS5B6, price €850, $950, 950 Swiss francs. Read more here. The Gent Automatic by Aerowatch has a sort of distinction and refinement that I would associate with the “gentleman” concept. Even though it is a very moderate 39 mm in diameter, and so in terms of size it could be worn by both men and women, its style is definitely masculine, with minimalist hour markers, a nicely-positioned date at 6 o’clock, and a lovely brown leather strap with alligator print texture and visible stitching, pin buckle. It is truly a classic watch, what watches used to be back in the 1950s, simply instruments for telling the time that would become part of your life, running for ever as long as you wore it and performed the usual maintenance every few years. 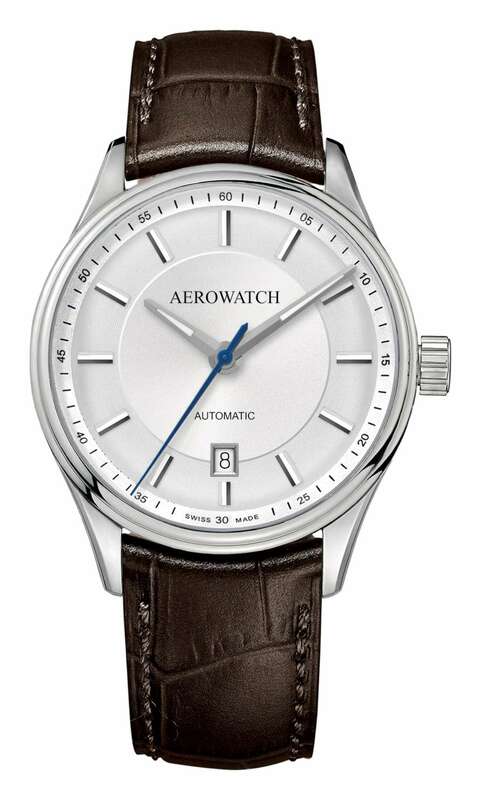 The Aerowatch Gent Automatic is powered by the self-winding ETA 2824-2 movement. Read more here. 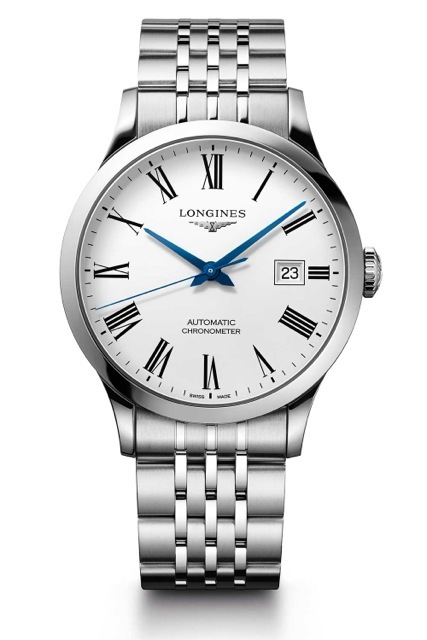 Part of the new watches for Longines’ 185th anniversary, the Record has a very classical design, with Roman numerals, blued hands, and a steel case. It is the first watch by Longines to have a chronometer-certified movement, ETA A31.L11, with a silicon balance spring. 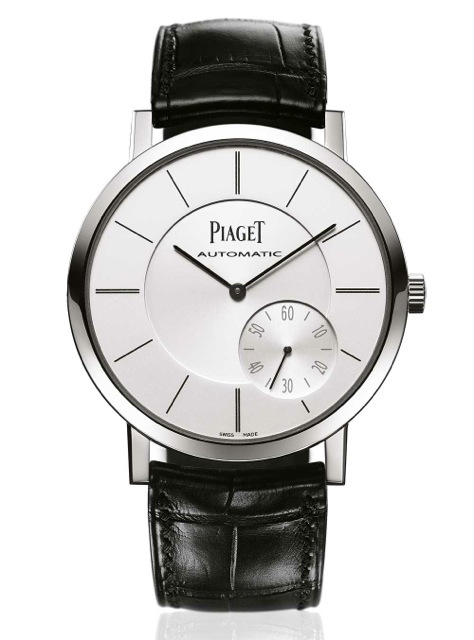 The self-winding movement has 22 jewels, and provides a power reserve of 64 hours. It runs at 25,200 vibrations per hour, an unusual rate, 3.5 Hertz. The watch is available in a complete range of case sizes, 26mm, 30mm, 38.5mm and 40mm, all with a 3 atm water resistance. The bracelet is in stainless steel with a folding clasp. Price €2,040. 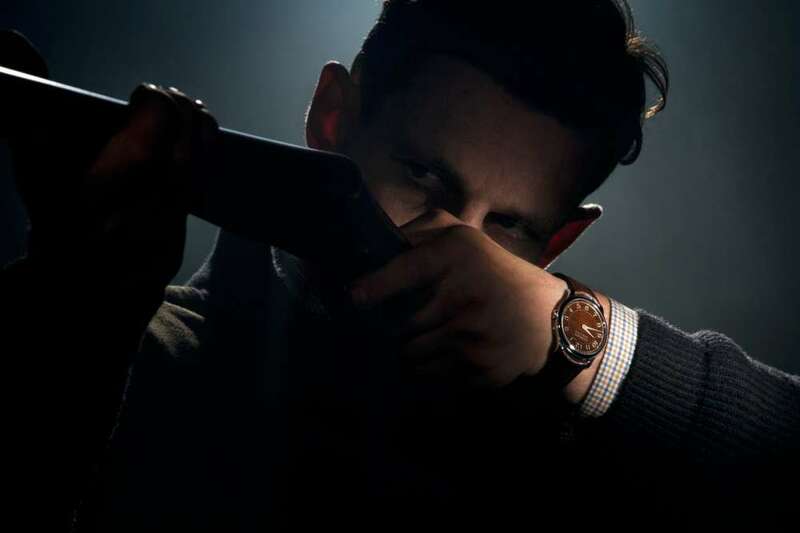 More info on the Longines website. Zenith takes part in the Distinguished Gentleman’s Ride, a global charity event raising funds and awareness on prostate cancer research. 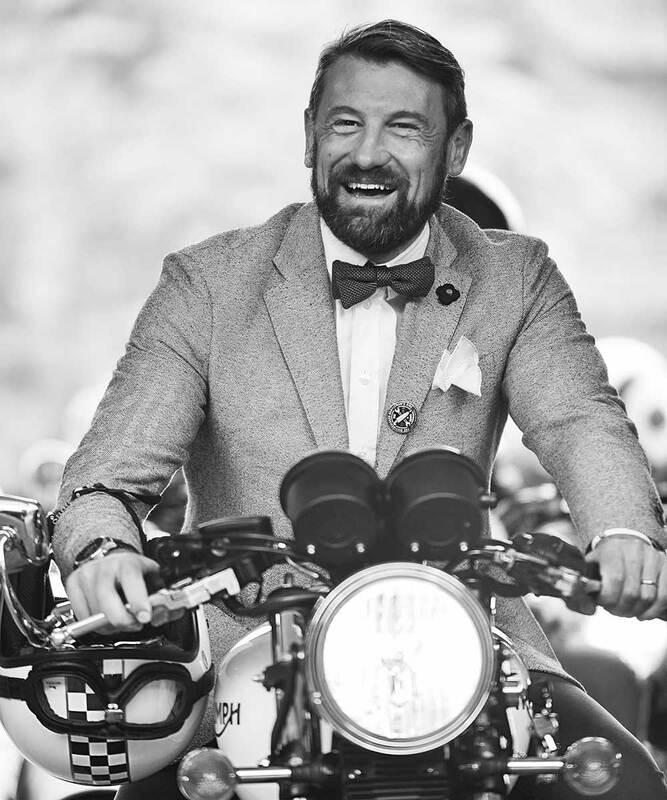 Founded in 2012 by Mark Hawwa, the DGR features smartly-dressed gentlefolk who ride their custom and classic motorcyles in fund-raising rallies. 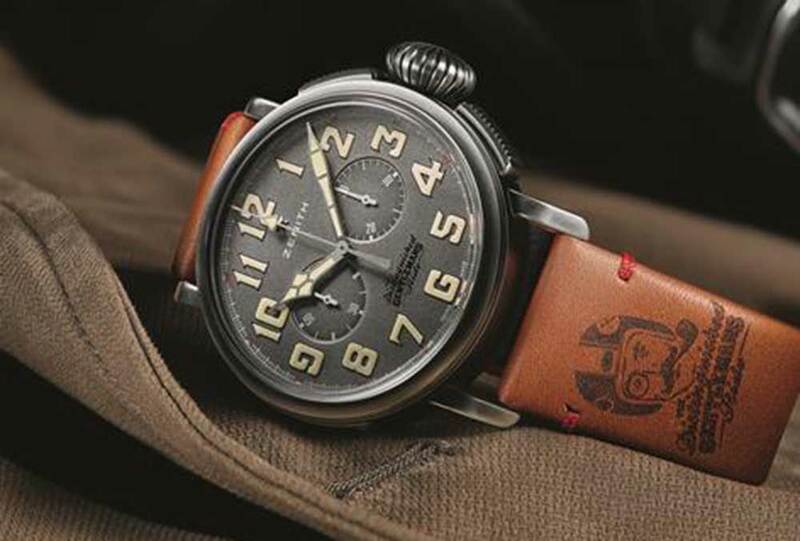 The watch that Zenith links to the DGR is the Heritage Pilot Ton-Up, a version of their classic Type 20 Chronograph, with a specially-branded strap and caseback. The “ton-up” in the name refers to the 100 miles per hour objective for “café racer” customized motorbikes in races that start and finish at a café. The watch has all the characteristics of a pilot’s watch, with a large 45-millimetre case, 14.25 mm thick, large Arabic numerals, and a giant conical crown. Dial clarity is excellent, with no date window, and just two subdials, for 30 chronograph minutes and continuous seconds. The dial colour is a perfect match to the aged steel case and pushers; the engraved caseback is in titanium to reduce weight. Inside, the El Primero 4069 movement is one of the most famous chronograph movements of all, a classic running at 36,000 vibrations per hour, 5 Hertz, with 50 hours power reserve. Column wheel and horizontal clutch. Price €6,900. More info on the Zenith website. Slim, fit, meticulous attention to detail, absolute quality throughout, a touch of humour: a description of Breguet’s Classique 7147 is also a good portrait of the modern gentleman. 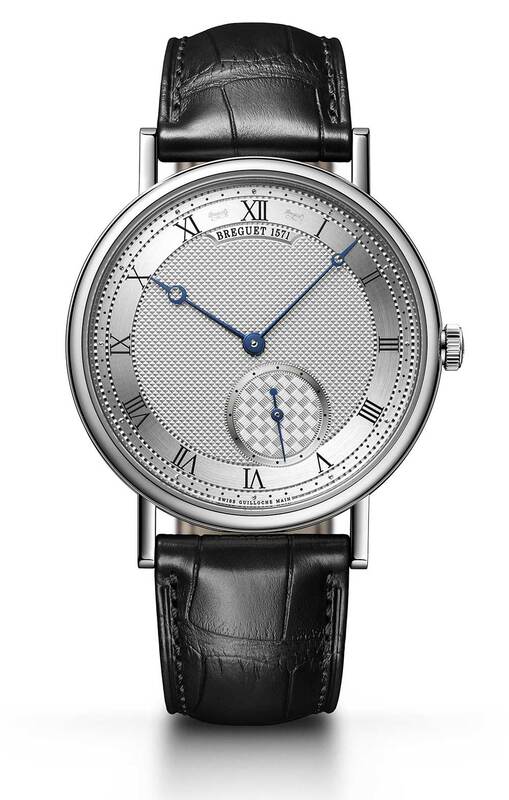 Breguet presented this watch at the launch of its “Classic Tour” in London on 4 October 2017, “honouring the art of living of a true gentleman.” This version of the Classique has a distinctly vintage appearance, with fluted caseband, blued steel Breguet hands, secret signature, and a silvered gold dial with different types of guiloché, Clou de Paris in the centre and cross-weave pattern on the offcentred small seconds subdial. The 40-millimetre case is very slim, available in white or rose gold. Water resistance is the standard 3 atm. Price €21,300. Read more here. 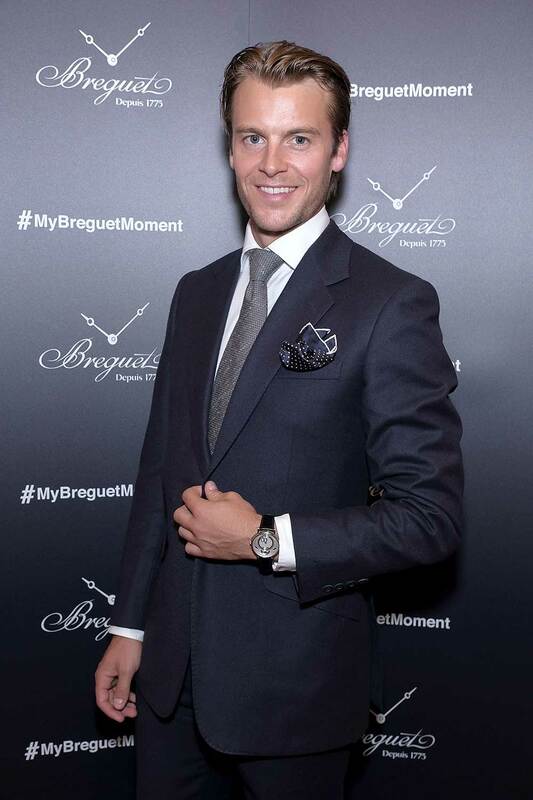 Miles Bugby, present in London for Breguet’s Classic Tour event that will visit other major cities. The Altiplano celebrates its 60th anniversary in 2017, and Piaget has presented several new models, but the Altiplano G0A35130 was already part of the collection. It is prodigiously slim at 5.25 mm, with a self-winding movement just 2.35 mm thick, and it has a minimalist dial with a quirky touch, the small seconds subdial at 4 o’clock. The white gold case, 43 mm in diameter, with black alligator strap makes it a watch perfect for formal events. Water resistance is lower than usual at 2 atm. The 1208P movement is beautiful, visible through the sapphire caseback, with a micro-rotor in pink gold. It runs at 21,600 vibrations per hour, 3 Hertz, and provides 44 hours power reserve. Price €23,900. Read more on the Piaget website. The F.P. Journe Chronomètre Holland & Holland is a hand-wound watch with dials made from the Damascus metal originating from two antique guns. A fine gun was once part of a gentleman’s armoury, and there are some intriguing connections between gunmaking and watchmaking – crafts which share terms like “barrel” and “calibre.” This watch by F.P. 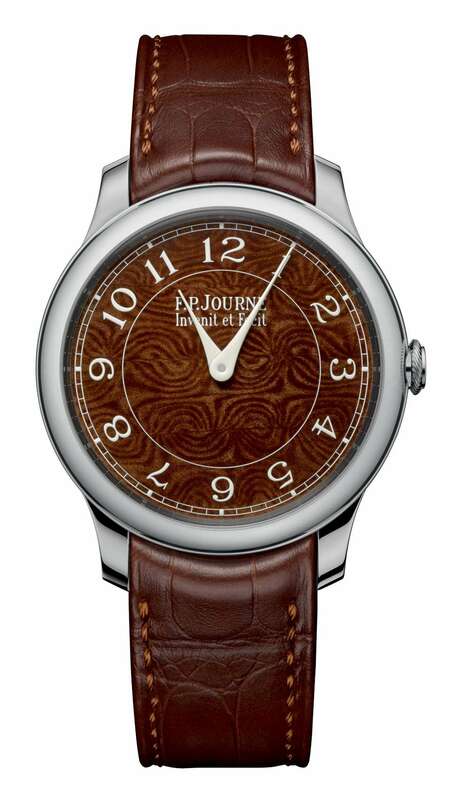 Journe is made from the Damascus steel barrels of two antique Holland & Holland guns. It is moderately sized and very slim, with a steel case 39 mm in diameter and 8.6 mm in thickness. The in-house F.P. Journe calibre 1304, hand-wound, has two mainspring barrels providing about 56 hours power reserve. The balance runs at 21,600 vibrations per hour, 3 Hertz. 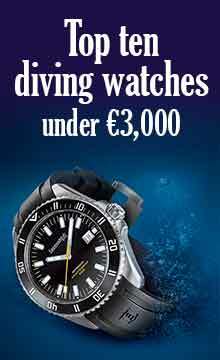 The watch is priced at €51,500 inclusive of tax. Read more here.